The Aird Bungalow website has always used cookies as outlined above, but we now need to inform you of this. 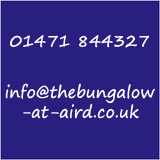 Copyright: The Bungalow at Aird 2019. All images are protected.